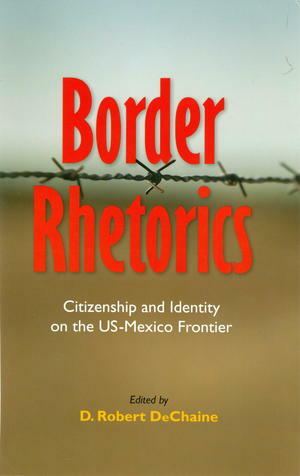 Border Rhetorics is a collection of essays that undertakes a wide-ranging examination of the US-Mexico border as it functions in the rhetorical production of civic unity in the United States. A 'border' is a powerful and versatile concept, variously invoked as the delineation of geographical territories, as a judicial marker of citizenship, and as an ideological trope for defining inclusion and exclusion. It has implications for both the empowerment and subjugation of any given populace. Both real and imagined, the border separates a zone of physical and symbolic exchange whose geographical, political, economic, and cultural interactions bear profoundly on popular understandings and experiences of citizenship and identity. The border’s rhetorical significance is nowhere more apparent, nor its effects more concentrated, than on the frontier between the United States and Mexico. Often understood as an unruly boundary in dire need of containment from the ravages of criminals, illegal aliens, and other undesirable threats to the national body, this geopolitical locus exemplifies how normative constructions of 'proper'; border relations reinforce definitions of US citizenship, which in turn can lead to anxiety, unrest, and violence centered around the struggle to define what it means to be a member of a national political community. Copyright © 2012 The University of Alabama Press. Used with permission.